Explore the dangerous terrain of your home or office with the SRV-1 Mobile Robot. 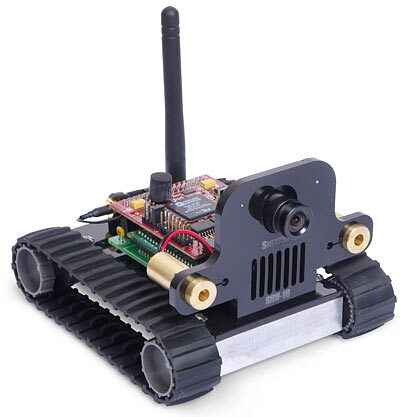 This palm sized bot packs tank-like treads a 1000MIPS 500MHz Blackfin BF537 processor and a mini video camera. Using 802.11b/g wi-fi the SRV-1 interfaces wirelessly with a remote PC. The Java-based console software includes a built-in web server to monitor and control the SRV-1 via a web browser from anywhere in the world, as well as archive video feeds on demand or on a scheduled basis. Get programming with fully open-source software for robot and host computer. The SRV-1 Mobile Robot comes fully assembled and ready to use, but requires some technical knowledge of Java, networking and the command line to set-up the software. If you feel comfortable tinkering and have had experience configuring a basic web server you should be in fine shape. Read the SRV-1 Set-Up Instructions and you'll have a good idea if you've got what it takes. - RoboRealm - http://www.roborealm.com/help/Surveyor_SRV1.php - The SRV-1 can now be directly controlled from RoboRealm, a very popular Windows-based machine vision software package for robots. The RoboRealm extensions for SRV-1 allow creation of scripts that combine image processing on live video feeds from the robot, e.g. color filtering, blob detection/tracking, edge detection/outlining and feature extraction, with decision processing and robot motion control, making it easy to create behaviors such as object location and tracking, obstacle avoidance, motion detection, notification, etc, with a web interface, and control can be scripted from C/C++, Python, Java, C#, Lisp, Visual Basic, WScript and COM through the RoboRealm API. - Microsoft Robotics Studio - http://www.surveyor.com/MSRS.html - Drivers for the SRV-1 in Microsoft Robotics Studio are now available. MSRS is a Windows-based environment for academic, hobbyist and commercial developers to create robotics applications across a wide variety of hardware. Key features and benefits include: end-to-end robotics development platform, lightweight services-oriented runtime, and a scalable / extensible platform. - Webots - http://www.cyberbotics.com - SRV-1 support is now included in Webots mobile robotics simulation software. Webots provides a rapid prototyping environment for modelling, programming and simulating mobile robots under Windows, Mac OS/X and Linux. The 3D modeling and physics are outstanding.